How do you install OBDKey? Do you provide OBDKey (OBD to USB) USB Drivers for Windows 7 and Windows Vista? Does OBDKey Support Windows 10? Will OBDKey work with all OBD-II compliant vehicles? Does OBDKey support vehicles with ISO 9141, KWP2000? Does OBDKey support vehicles with SAE J1850? Does OBDKey support vehicles with latest CAN bus? 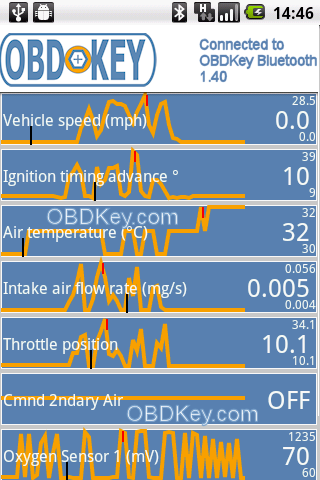 OBDKey Software supports standard OBD Modes 1 to 9. The OBDKey unit can also access many protocol modes beyond OBDII. OBDKey can be configured to transmit to any 11bit or 29 bit CAN addresses (id's), at many CAN bit rates, allowing access to data beyond standard OBD-II information. OBDKey can be configured to receive from any 11bit or 29 bit CAN addresses (id's) and CAN speeds up to 1,000 kilobits per second. Software development support (SDK) available with sample code (C# and C++). Firmware version 1.40 now in production. Firmware 1.40 is upgradeable using a Windows application supplied only to OBDKey customers. Subaru SSM protocol (like ECUExplorer / JDash ) fully supported. Subaru Support with OBDKey. User may programmatically write data to FLASH memory directly. Maximum send and receive frame sizes increased beyond OBD-II requirements. OBDKey supports the useful ELM327 AT commands set. OBDKey USB only :User may programmatically set the PC to device baud rate to 38400, 57600, 250000, 500000 bits / second. Step 1: Locate the diagnostic port in your vehicle. Step 2: Connect your OBDKey unit to the diagnostic port. Step 3: Install the software supplied on the 2.0 GB USB flash drive (memory stick) to your PC, Pocket PC, PDA, Palm or Smartphone. First plug your OBDKey into your vehicle's OBD-II data link connector. This is usually under the steering wheel, in the centre console, under the handbrake or in the passenger side footwell. OBDKey will automatically detect the type of vehicle communications that are required. Install and run the supplied software on your PC, Pocket PC, Palm or mobile phone. The software will detect the OBDKey unit via Bluetooth or via USB automatically. The OBDKey software will then will access the vehicle�s on-board computers and will inform what problems may exist and will provide live readings from each of the vehicle sensors. OBD stands for on-board diagnostics and defines the modern fuel managed vehicle's electronic interface system. The OBD interface is available on all OBD-II / EOBD compliant vehicles. 2001 and newer petrol cars sold in Europe are EOBD compliant. Diesel (compression ignition) vehicles were not required to support OBD until 2004. Some pre-2001 petrol vehicles and pre-2004 diesel vehicles have a 16-pin connectors but they may not be OBD-II or EOBD compliant. OBDKey also features full CAN bus compatibility with the latest vehicles from 2008 onwards. Locating your OBD connector can be a difficult task as vehicle manufacturers tend to hide away the socket. But it is worth knowing that the OBD connector will always be found inside the vehicle and within easy reach from the driver's set position. Check in the driver's foot well, under the steering wheel, behind panels in the dashboard fascia and the central area between the driver's seat and the passenger seat. Some connectors have been located behind ashtrays, under the passenger seat and even over by the passengers door. Once you find the OBD connector, check which pins which are present. The view above is shown looking into the connector, with the locating "bump" at the bottom. The connector must have pins 4, 5 for ground connections and pin 16 for 12 volt power supply from the vehicle battery. Pin 2 and pin 10 for SAE J1850 (PWM or VPWM) protocols. Pin 7 for ISO 9141-2 and ISO 14230 (KWP2000) communications. Pin 7 is also known as the K-Line. Pin 15 is also known as the L-Line. may or may not be present for these protocols. Pin 6 and pin 14 are present for CAN bus (ISO 15765-4) protocols. CAN: Ford, Mazda, Volvo since 2004. Some vehicles have a CAN bus system along side the ISO/KWP2000 system for diagnostics as well as inter-module communications. Full CAN bus compatibility with the latest vehicles from 2008 onwards. Does OBDKey Support Windows 7, Windows 8 and Windows 10? Yes. We have written a user guide on how to configure the OBDKey Bluetooth and OBDKey USB devices under Windows 7, Windows 8 and Windows 10. Download here (PDF). Do you provide OBDKey (OBD to USB) USB Drivers for Windows Vista, Windows 7, Windows 8 and Windows 10? Yes. The drivers are supplied on the 2.0 GB USB flash drive (memory stick) in the "USB Drivers" Folder (and "USB Drivers\Windows x" respectively). Once installed you will see the successful installation dialog box. J1850 comes in two variants, PWM and VPWM. OBDKey supports BOTH variants. Since 2003, some vehicle makes and models started using a new diagnostic communication protocol called CANbus. By 2008 all vehicles sold for the United States market must use the CANbus protocol. Since 2005 Aston Martin, since 2005 Audi, since 2007 BMW, since 2007 BMW Mini, since 2004 Chrysler, since 2003 Ford, since 2003 General Motors, since 2006 Saab, since 2006 Honda, since 2006 Jaguar, since 2005 Land Rover, since 2003 Mazda, since 2005 Mercedes, since 2006 Mitsubishi, since 2007 Porsche, since 2007 Subaru, since 2004 Lexus, since 2004 Toyota, since 2004 Volvo, since 2006 Volkswagen. OBDKey also features full CAN bus compatibility with the latest vehicles from 2008 onwards. OBDKey is available with a wired communication link to a standard USB (2.0) connection. Full software drivers are supplied for the PC to which the OBDKey will be connected. OBDKey is available with a wireless, Bluetooth, link to any device equipped with a built-in or add-on Bluetooth radio device. Software may be sold separately, depending on the device. See software section. OBDKey is available with a wireless, WiFi, link to devices equipped with a built-in or add-on WiFi / WLAN / 802.11 radio device. Application software may be sold separately, depending on the device. See software section. Display engine management diagnostic fault codes in plain text by decoding the standard "P" codes. OBDKey is compatible with some third party Java based applications. Not at first release. See the software section for more information. See the OBDKey WiFi for more information.